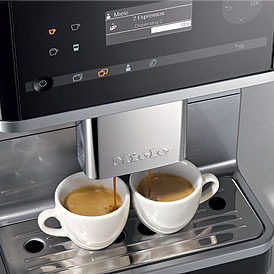 Enjoy the pleasure of first-class coffee with the convenient new Miele CM6310 White Coffee System. 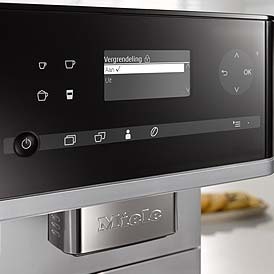 Simply press one of the four main symbols to create your favorite coffee specialty right in the comfort of your own home. This coffee system allows you to create up to four user profiles that personally tailor the coffee making process to fit each member of your family. Save time with the OneTouch for Two function, which makes two drinks at once or double-portions for those early mornings when you need it most. Contains ten portion size options that take the hassle out of making single and double servings of espresso, coffee, cappuccino, latte macchiato, and cafe latte. Additional features include a heated cup rest and dedicated hot water spot to help make your coffee making experience, simple, fast, and extremely delicious! The DirectSensor control panel with modern touch function and a four row text display offers extraordinary user convenience. With OneTouch and OneTouch for Two functions and storage for up to four user profiles, you can enjoy your coffee your way every time. 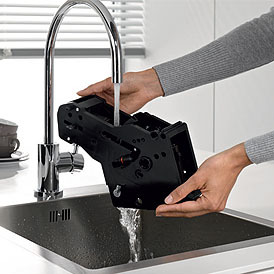 Automatic rinse and cleaning programs, an easily removable brew unit, and dishwasher-safe components ensure hassle-free clean up. 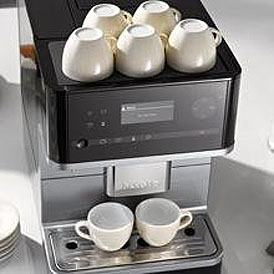 For that perfect finishing touch, the heated cup rack allows you to enjoy coffee from pre-heated cups any time.